Born at Purbrook, Simcoe County, Canada West (now Ontario), on 5 January 1848, fourth son of Captain Elmer Steele RN and Anne Macdonald, he received his education at Orillia (Ontario) and the British American Commercial College (Toronto). He served with Her Majesty's 17th Regiment during the Fenian Raid of 1866 and with Colonel Wolseley on the Red River Expedition of 1870. In 1871 he joined the “A” battery of the Royal Canadian Artillery and in 1873 joined the North-West Mounted Police as Troop Sergeant-Major, accompanying the corps on its march to the Rocky Mountains in 1874. From 1878 to 1885 he was first Inspector, later Superintendent, of the Canadian Pacific Railway construction through the Rocky Mountains. During the North-West Rebellion of 1885, he commanded the cavalry and scouts of Major-General Strange’s column, being present at Frenchman’s Butte and Loon Lake. He was mentioned in despatches and received a medal, with clasp, for his successful pursuit of Big Bear’s band. He commanded “D” division of the North-West Mounted Police during the gold rush to the Klondike in 1898 and was a member of the Yukon Territory council from 1898 to 1899. 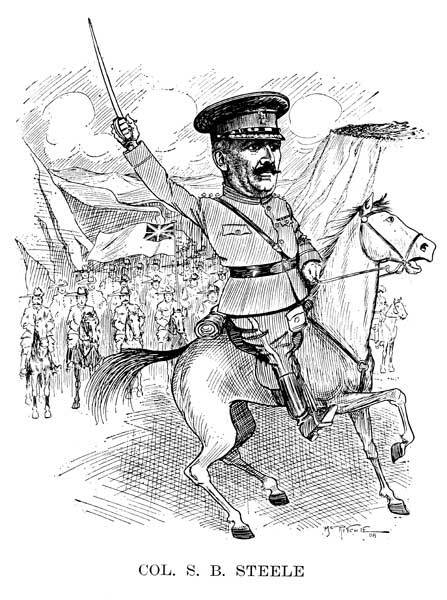 He then served with distinction in the Boer War, organizing and commanding the Lord Strathcona Horse, and was given the Queen’s medal with three clasps. 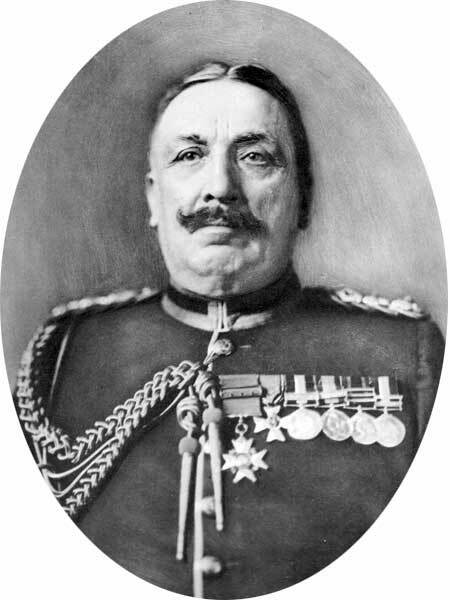 From 1901 to 1906 he had charge of eight magisterial districts and reorganized the entire South African Constabulary. Steele returned to Canada in 1907 and was given command of M.D. 13 with headquarters at Calgary, from which place he transferred to Winnipeg in 1909 to command M.D.10. In December 1914, he was appointed Inspector-General of Canadian western forces and from February to December 1915 was commander of the Second Canadian Division. During the First World War, from September 1915 to January 1918, he commanded the Canadian and Imperial troops at Shorncliffe. In 1900 he was created a CBE and in 1917 a KCMG. In 1890, he married Marie Elizabeth Harwood (?-? ), daughter of Robert W. Harwood, Seignieur of Vaudreuil. He had a son and two daughters. He died at London, England on 30 January 1919, and was buried in June 1919 in the St. John’s Cathedral Cemetery. “Happy Birthday(s), Sam Steele” by Murray Cayley, The Beaver August-September 2008, p. 56-57.